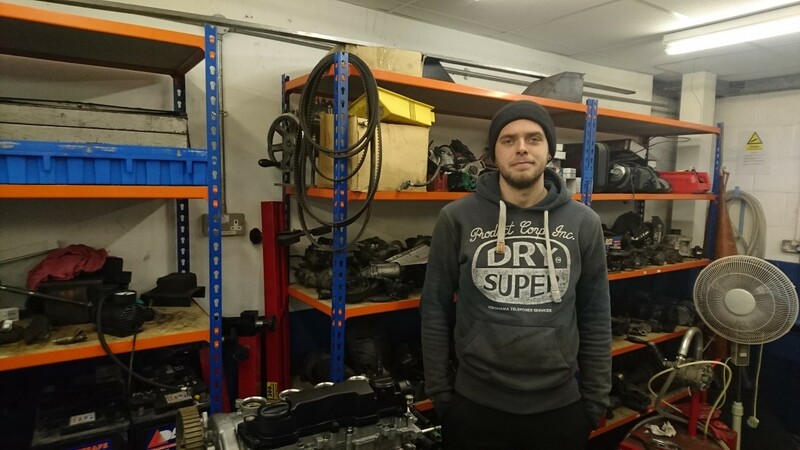 Alfie Edwards from Strood began his Intermediate Apprenticeship in Motor Vehicle Maintenance and Repair in 2015. Alfie states, “I have always had a fond love of cars and stuff like that. I actually carried out a body repair course before I started my mechanics course but I moved on to the mechanics course to further my knowledge of mechanics. “I’ve learned everything from filling up washer fluid to complete engine rebuilds, drive trains, gearbox and suspensions, how exhaust systems work – everything! I’ll definitely carry out the Level 3 course next to make myself more beneficial to an employer. “I came across the apprenticeship through word of mouth. I lost my old job in a bodyshop and they informed me about an apprenticeship going in the mechanical side of vehicles so I got in touch with IPS and it went from there. “I do all of my work in-house with the IPS assessor coming out every couple of weeks to check on what we are doing and do the written assessments and observations. “My tutor was always fair and pretty clear about how things worked and always there to help if I needed it. When my assessor changed, the new one followed in the same footsteps and it’s been the same, it’s been really good. When you’re doing a job that you know you’ve got an observation on, you just phone him up and nine-out-of-ten times he’ll be there. “I passed my GCSEs so I only needed to do ICT as part of the functional skills. The learning platform for that was brilliant; all the packs that IPS have given me over the years were really beneficial and they definitely make your knowledge broaden from what I previously knew about computers.